Heat oven to 375°F. Spray 11x7-inch (2-quart) glass baking dish with cooking spray. In 10-inch skillet, heat oil over medium heat until hot. Add celery, onions and garlic; cook 1 to 2 minutes, stirring occasionally, until vegetables begin to soften. 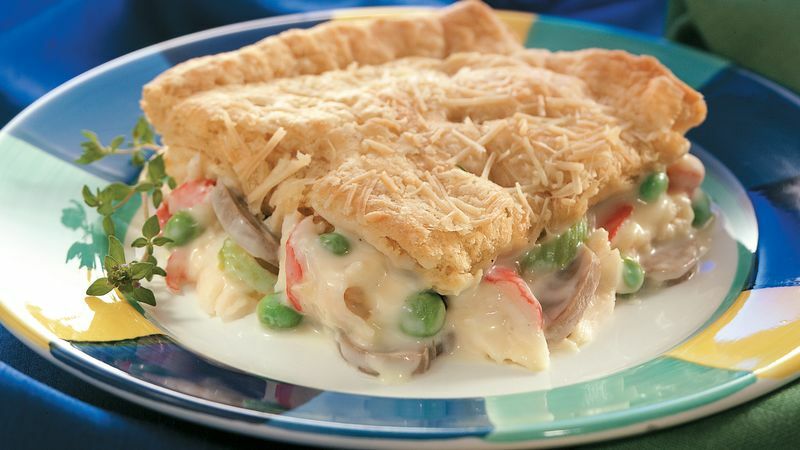 Stir in peas, imitation crabmeat and mushrooms. Cook 3 to 5 minutes, stirring occasionally, until thoroughly heated. Reserve 2 tablespoons of the cheese for topping. Stir remaining cheese and the pasta sauce into crabmeat mixture; cook 3 to 5 minutes, stirring occasionally, until thoroughly heated and cheese is melted. Spoon into baking dish. Unroll dough into 2 long rectangles; press perforations to seal. Place rectangles over crabmeat mixture; pinch center edges to seal. Press outside edges of dough to edges of baking dish. Cut several slits in dough for steam to escape. Sprinkle with reserved 2 tablespoons cheese. Bake 15 to 20 minutes or until thoroughly heated and crust is golden brown. To serve, cut into squares. For nutty cheese flavor, try Asiago in this casserole. Like Parmesan, Asiago is an Italian cheese aged for grating. Asiago that is less than a year old is a lovely table cheese. Dough-topped casseroles must be assembled while the filling is piping hot to ensure even cooking from underneath as well as on the surface. Otherwise, the topping will bake at the surface but remain doughy next to the filling. As the filling heats, prepare the dough so that everything is ready to assemble at once.